When checking the statistics I was quite surprised to see that he market has managed to work off its overbought reading in the past two weeks, even though the S&P 500 has climbed nearly 2%. 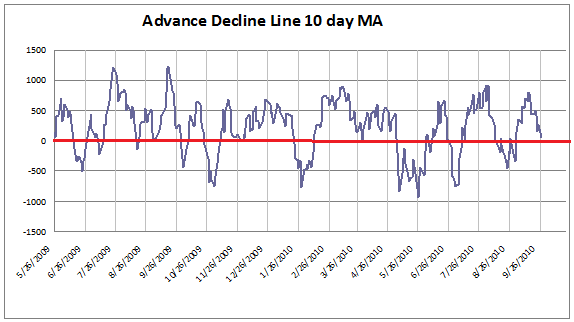 Breadth has been underperforming as the rally has narrowed. I would point out that we are not oversold yet. 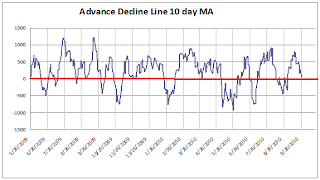 If we do get a nice down day some time this week it could probably be bought for a trade as that would get the market oversold and we would be heading into the seasonally strong turn of the month. One more rally next week would get the market overbought in the intermediate term and likely finally lead to a sentiment extreme. At that point we could probably expect a larger correction.